New giveaway free license key for CyberGhost Premium VPN.It a god news, after old giveaway CyberGhost VPN serial license key expires. Download the apps and protect your internet for 1-year using VPN server. Normal price 1-year license key the VPN software is $69.99. On this giveaway the tool is absolutely free. CyberGhost is best VPN application to protect your internet connections. It perfect tools to help you surf on the internet anonymously & protect personal identify. CyberGhost Premium VPN also can break country restrictions on any website that not allow you to visit from your country. The free activation code offer CyberGhost VPN is a short time promo. New Giveaway Page CyberGhost VPN: Visit this link! Visit the giveaway to download CyberGhost VPN with free activation code. Use valid email address to request the license because the code will be sent to your email. Use download link in your email to download the giveaway version installer, and use activation code to use full unlimited traffics. The CyberGhost VPN license key obtained from the giveaway is active for 12 months. After giveaway ended, you can use CyberGhost VPN coupon code to get full license the software. 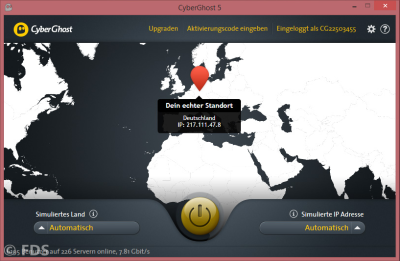 CyberGhost VPN prevent tracking software to detect your IP and locations. The new version also offer protection for PC, Mac, iOS, and Android. Tried this. They let me enter my email first before saying there's no more serial available. Not very trustworthy business practice. Dont use your primary email for this.